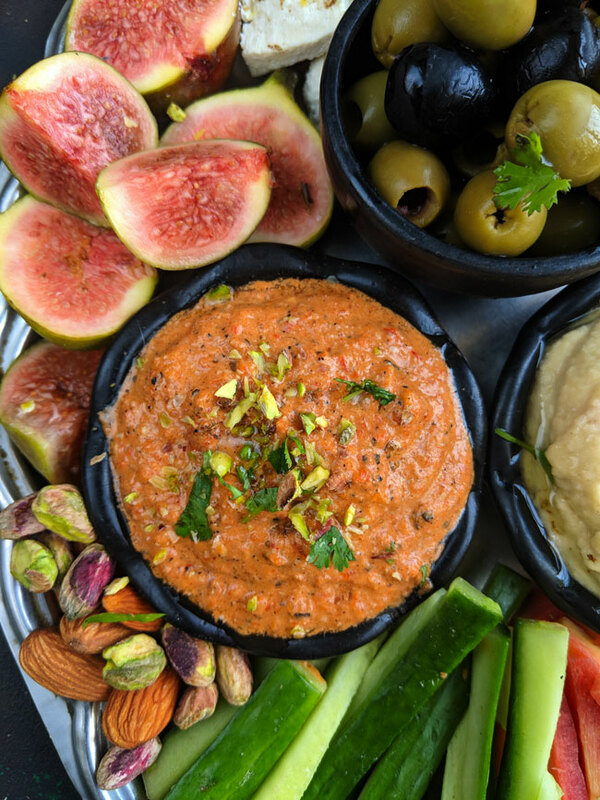 Mezze Platter – The ultimate Mediterranean party platter loaded with hummus, red pepper dip, pita chips, veggie sticks, feta cheese, falafel, olives, and figs. 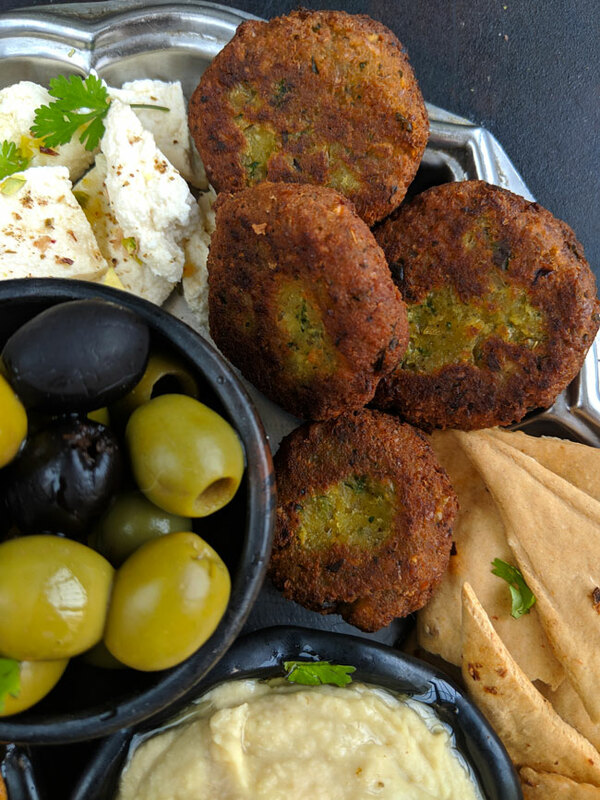 The best thing about this mezze platter is – it is 100% vegan (skip cheese), vegetarian and could be gluten-free too (if you get hold of gluten-free pita bread/lavash). What’s on your table this party season? (Also read: 10 Best Indo-Chinese Party Recipes). While we’re in the middle of the party season, this platter is a great idea to form a fabulous centerpiece for your snacks table. All you need to do is choose what appetizers to include and keep them ready. The platter can be refilled as often as required with the selected pre-made goodies. So you can also shake a leg or two during the party. 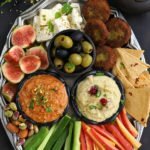 What is a mezze platter? A Mediterranean platter is an assortment of several Middle Eastern bite-size snacks served in one platter/dish. The word ‘Mezze’ literally means sharing. 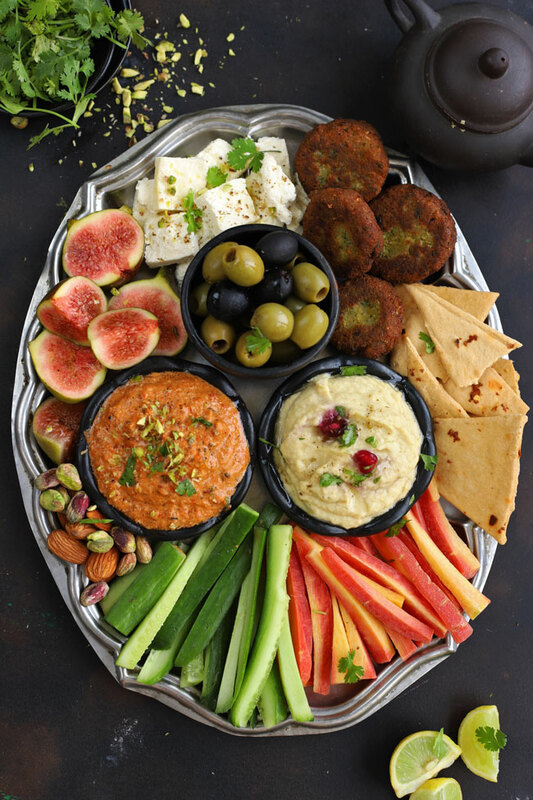 Hence, the purpose of a mezze platter is to have shareable appetizers on the table – an important aspect of Arabic and Middle Eastern cuisine. A mezze platter can be both vegetarian or meat-based (with kebabs, meat skewers or roasted chicken), depending on personal preference. 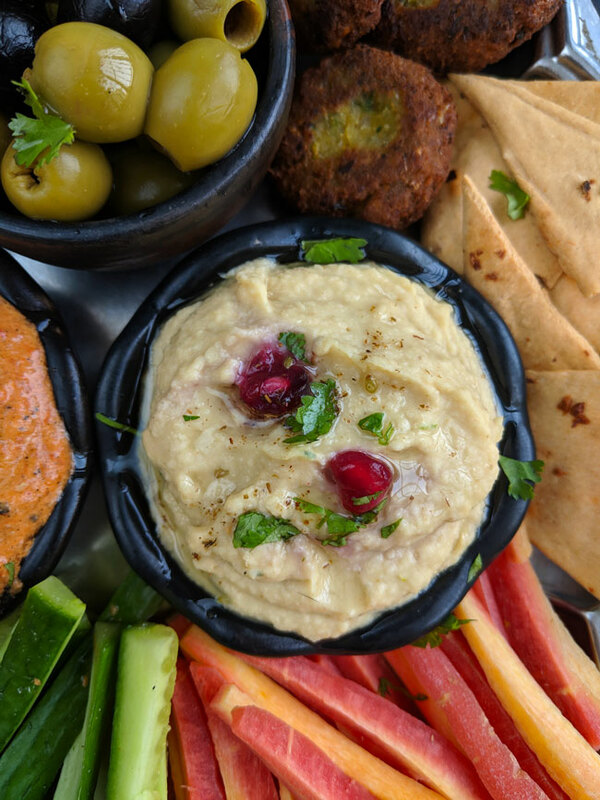 Most mezze platters contain popular appetizers like hummus, tabbouleh, feta cheese, olives, pita or any other bite-size bread, crackers, and one or two Mediterranean dips. 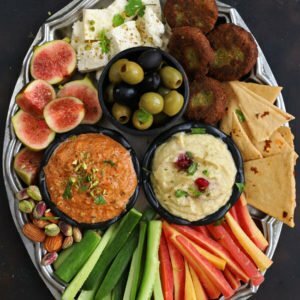 How To Build A Mezze Platter? 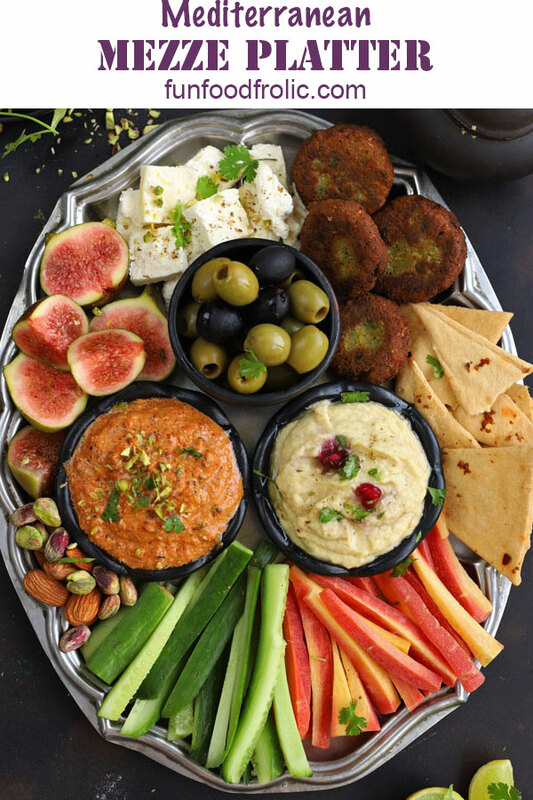 It is enjoyable to create your own Mediterranean party platter. You can serve it with wine or even chilled beer. It is entirely fuss-free and requires minimal cooking time. Will it be vegetarian or non-vegetarian? The choice depends on the people you are serving the snacks. If it’s a mixed crowd or if you’re unsure of preferences, it’s recommended to go for a vegetarian mezze platter. Since the appetizers are served in a single dish, vegetarians may not feel comfortable eating from the same tray in which meat is also served. How many snacks is enough? The idea of a snacks platter is to serve easy to eat finger food. So try not to serve too many items in a single platter. It is not the display of your cooking skill. Instead, a fun way to share flavorsome nibbles with loved ones while drinking. One or two fulfilling snacks like falafel/kebab accompanied by dips, munchies and fresh cheese/veggies is good enough. Selection of snacks: Try to serve snacks that compliment each other. Like hummus can be enjoyed with crackers, bread or veggie sticks. 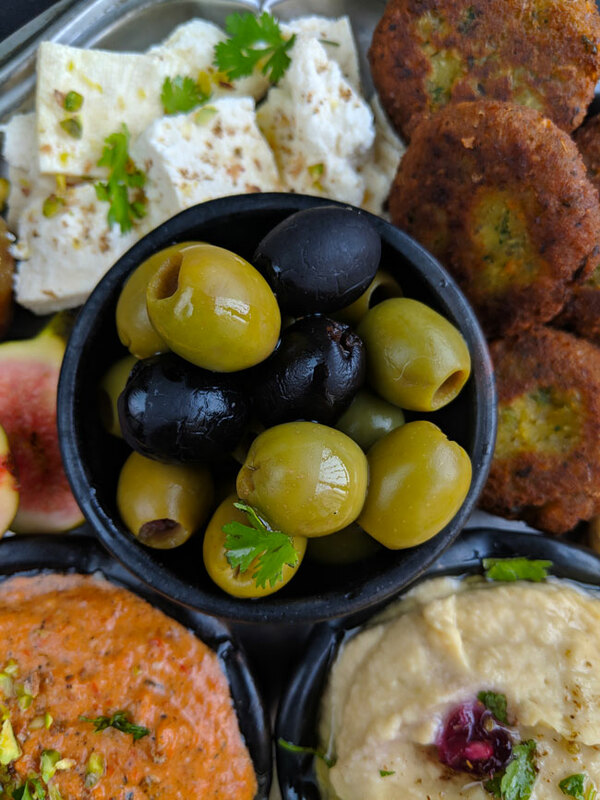 While soft cheese tastes best with marinated olives or fresh fruits whereas falafel/kebab are best enjoyed with a spicy dip. It is essential to have harmony among the various dishes in a mezze platter. Also, include snacks that are easy to eat (non-drippy, not huge pieces that become embarrassing to tear or require cutlery). Keep it non-greasy: Nobody likes the sight of a calorie-loaded appetizer platter. Hence, it is crucial to keep your snacks platter a bit refreshing and non-greasy. Try to include only one or deep-fried snack, that too accompanied by loads of fresh produce such as – fruits, veggie sticks, cheese, olives, and a cooling dip. Falafel: These are my signature quinoa falafel. But the regular chickpea falafel or any other kind of fulfilling nibbles such as mixed veg cutlets or grilled paneer tikka can be included in this platter. Dips: No platter is complete without a good selection of dips. Creamy Hummus is the classic and preferred dip alongside a spicy roasted red pepper dip. Both have contrasting flavors and add so much variety to the snacks platter. Marinated Olives: I love olives, and for me, they are a must-have item in any Mediterranean platter. It is best to get your hands on best quality packaged olives. The olives not necessarily have to be marinated. The ones soaked in brine solutions works fine too. I serve a combination of black and green olives for the variety of taste. Crackers: From crispy pita bread, lavash to cheese crackers or any readymade munchy that has a nice crunch to it is perfect for this party platter. I usually stick with pita chips or lavash for an authentic Mediterranean platter. Both can be easily purchased from the nearby bakery or supermarket. Veggie Sticks and Fresh Fruits: Bite-sized and easy-to-dip sticks of crunchy, fresh vegetables and fruits give so much freshness to the platter. Some options are cucumbers, carrots, radish, cherry tomato, green and red bell peppers (served raw) or grilled veggies like herb potatoes, sweet potato fries, etc. Some of the fruits that taste best in a platter like this one are – figs, red seedless grapes, black grapes, strawberries, cantaloupes or watermelon. Cheese & Nuts: Finally any non-crumbly soft cheese cut into bites, and a choice of assorted dry-fruits or nuts will give your snacks platter an edge. To keep it simple, I have included the olive oil marinated feta cheese, salted pistachio, and almonds. The other variety of dry fruits that taste good in a mezze platter are – dried figs, apricots, salted cashews, sweet dates or toasted hazelnuts. Mezze Platter - The ultimate Mediterranean party platter loaded with hummus, red pepper dip, pita, veggie sticks, cheese, falafel, and olives. Prepare both the dips few hours before the party and keep in the fridge. Next, prepare the mixture for falafel, shape them, arrange in a plate and keep in the fridge until ready to deep-fry. Meanwhile, arrange the remaining elements in a large, serving platter except for nuts and keep that as well in the fridge. Before serving, heat oil in a frying pan for falafel. Fry them in small batches and transfer to a plate lined with an oil absorbent paper. Arrange prepared dips, falafel and assorted dry fruits in the mezze platter. Enjoy mezze platter with friends and family!